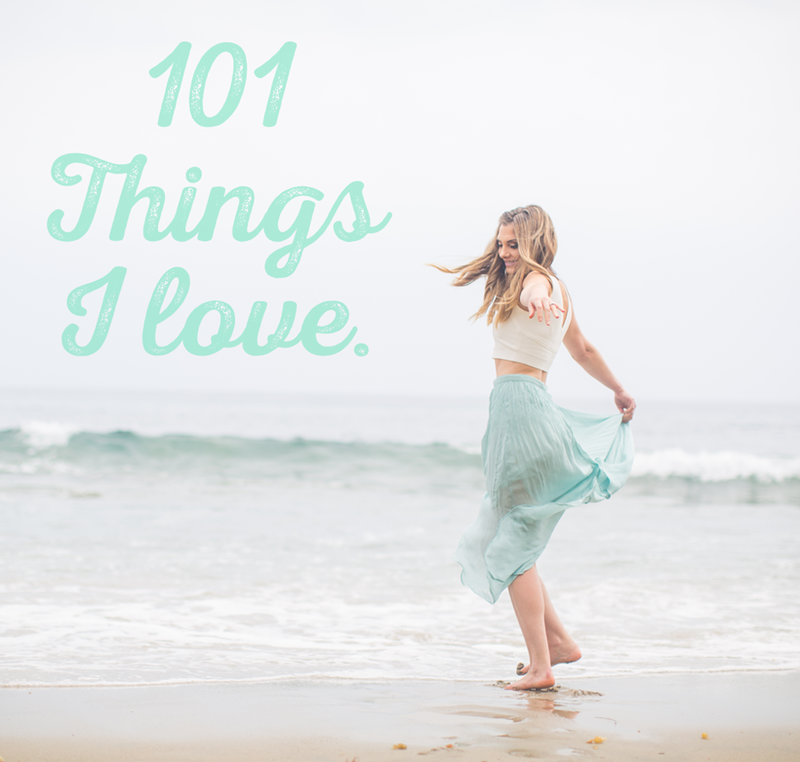 101 Things I Love. Happiness Reflection. Since it the Tuesday back after a holiday weekend, I am trying to continue to embrace that cozy, calm 'long weekend' feeling by doing some self-reflection writing today. And I am sharing it here in hopes that you will join in. Today's Inspiration: I recently stumbled upon a video by Kyle Cease, re-posted by my friend Sophie. It is called: "Why People's Opinions of You Are Not Real." While watching, there was one particular quote that stood out to me: "You are what you love and not what loves you." Why This Post: The Culture of Validation. In our virtual world of "liking" "heart-ing" "retweeting" and showing our online support of each other, we can get swept up in caring too much about how people respond to us. Who loves us. Who doesn't. From Instagram hearts, to retweets, Facebook likes and 'thumbs up' notifications on YouTube, the positive praise from the virtual world can get pretty addictive - especially for young people (teens, college students and young professionals) looking for self esteem building, attention and validation in such fresh, unfolding stages of their lives. And a little online love can certainly be a positive thing - a way of sending love, saying hello and showing support. But it can also turn toxic. Negative feedback, bullying, mean comments and stereotyping, being the worst of it. But also toxic to your self esteem and self worth: the feeling of getting swept up in other people's lives and comparing yourself to them. Comparing your successes to their successes. Your path to theirs. If we live in a world of comparisons, we will never be enough. We will always want more for ourselves. But maybe we are enough, right now. Maybe we have so much love and light in our lives right now that we should only feel grateful, happy, confidant and proud. Right now in this moment, you love SO MUCH. Really, just think about it. Make a list, like I did. Look how beautiful your world is. And how beautiful and awesome you are for loving this random collection of things -- the things that make you, YOU. These things that inspire you, light you up with passion and make you feel all warm and cozy inside. These loves are unique to you. Like a fingerprint from your heart. And ps. I started this list with the hopes of writing at least 50 things, thinking I could never make it to 100. But it was easier than I thought to keep listing and loving. And I could easily continue on for another 101 things. I tried not to get too perfectionistic about this, worrying about how 'cool' or 'moving' this list would be. Instead I just kept writing. The random things that popped into my head. As basic or quirky as they may sound. So if you try this for yourself, do the same. Just write, without self judgement or editing. 4. My family, near and far. 9. Weekend brunch. Waffles, pancakes, fruit, oatmeal, lattes. Good company. 10. Waking up early to see a pink sunrise. 11. Watching my cats sleep or roll around in sunbeams. 12. Dancing in my living room. Bonus points for Britney Spears music. 13. Getting home from a fancy party or event and putting on comfy, snugly clothes. 14. Beach air, the sound of crashing waves and a view of beautiful blue-green water. 17. Childhood photos. The kind you have to scan or snap to get online. 18. California. NYC. Paris. Miami. Maui. Switzerland. Italy. 19. Seeing the word vegan on a menu. 20. Bringing freshly-baked chocolate chip cookies to friends, family or to events. And watching people smile and get excited about them. 21. Thick foam on a vegan latte. Bonus points for latte art. 22. My niece's long and loud giggle. 23. When my nephew asks me a question about something I know the answer to. 24. When my nephew asks me a question I do not know the answer to. 25. Watching shelter, wild or farm animals who are happy and loved. Or rescued. 27. Dishes and clothes from Anthropologie. 28. Vintage episodes of Family Ties, Saved by the Bell, Full House or 90210. 29. Art galleries. Paintings. Being inspired and moved by art. 31. Singing loudly in my car and thinking I sound amazing. example: Let it Go, Elsa has nothing on me. 32. Disneyland. Anything Disney. Rides. Happy people. DOLE Whip. The Castle. 33. Walking in New York City. No destination needed. 35. 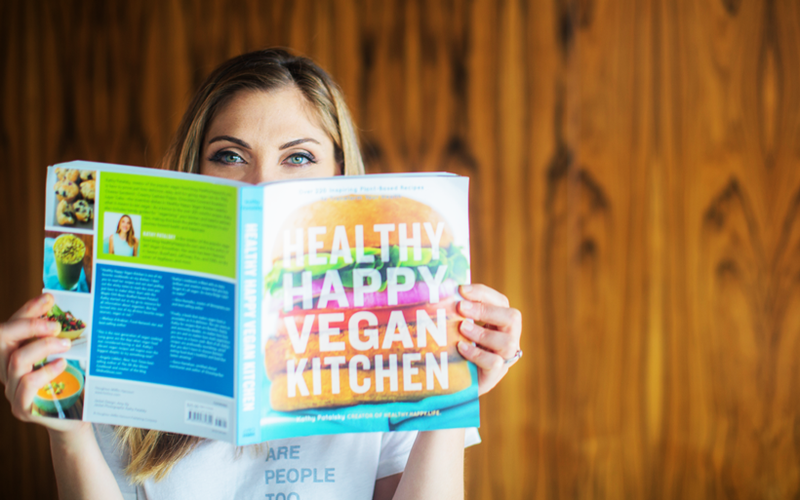 Saying "my cookbooks." And remembering I am an author. 37. Fruit. Fruit salads, whole fruit and fruit smoothies. My fruit monster status. 39. Listening to "Carol of the bells" + baking sugar cookies during Christmas time. Pumpkin-anything in fall. Watching Hocus Pocus in October. 40. Sitting down to a delicious looking dinner that I made myself. 42. Watching tennis. Playing tennis. Going to tennis matches like the US Open. 43. Taking photos when there is beautiful light. And beautiful scenes. 44. Getting together with a big group of girlfriends and talking about life, rather than work. 46. Enjoying my lunchtime smoothie, paired with a big sunbeam in my face, cozy kittens by my side. 47. Whole Foods. And making it out of there spending less than $100. 48. When my husband gets home after a long work day. 49. Any movie with Tom Hanks, Kate Winslet, Leonardo DiCaprio, Meryl Streep, Jack Nicholson, Michelle Pheiffer or Johnny Depp. 50. Watching movies in Los Angeles, when people clap and cheer at the opening and closing credits - and sometimes give standing ovations. Also: fellow movie lovers. And popcorn. 51. The sound of crickets humming. The sight of fireflies. Warm summer nights and after dinner strolls. 53. Laughing so hard that tears come out my eyes -- even better, laughing when you cannot stop and just have to keep giggling until it passes. 54. Crying from a fictional movie or TV show. Ex: Grey's Anatomy at their peak. 55. Comfort food. Vegan Mac and Cheese. Mashed Potatoes. Veggie Burgers. Banana Split. 56. Puffy white clouds in a blue sky. 59. Skirts that twirl or flow, and shoes that sparkle. 60. Tropical drinks with tiny paper umbrellas, when on vacation. 61. Really good guacamole with steamy, warm, handmade corn tortillas. 62. The Twilight movies. And books. Yes, really. 63. Anything that reminds me of pop culture from the 90's. 64. Books + audiobooks for long plane rides. Example: Yes, Please. 65. Embracing technology and learning how to weave it into my life in a positive way. 66. Wearing my hair in a high bun all day. Aka, fuss free hair. Also: no makeup days. 68. Looking at old photos of my parents from when they were "my age." Whatever that may be at the time. 70. Peanut butter and apricot jam sandwiches on toasted bread. 71. The moon roof in my car. 72. My bed. Fluffy comforter and pillows, soft buttery sheets, my Essentia mattress. 75. Bubble baths with salt and essential oils. 76. Spa days. Massages, steam rooms, saunas, facials, fluffy robes. 77. Driving "up the coast" through Malibu. Aqua water out my window. 79. Memories of playing in my backyard with my sister, fruit trees, sunshine and dress up. 80. Yoga and workout videos in my living room. 81. Driving on freeways with no traffic. 82. Encouraging people to follow their dreams, not matter how crazy or 'outside the box' they may sound. Helping people start a business, website or start a blog. 83. Kitchen stores and prop shopping for food photography. 84. Hearing good news from my friends and family. 86. Plopping down on the couch after cleaning the house. 87. Smiling at the sight of birds, butterflies and other 'urban wildlife' creatures. 88. Living in cities with seasons. Cozy winter days, brisk fall weather, spring sunshine, warm summer nights. 89. Living in cities without seasons. Flip flops in December, refreshing summer breezes, one wardrobe year round, smoothies in November. 90. Being happy and realizing it then and now. Being present in the moment. 91. Setting a spider or fly free outside rather than smashing it in fright or without stopping to think of other options. 93. Good TV. Breaking Bad, Game of Thrones, Parks & Rec and more. Also, Netflix. 94. Vegan restaurants that make me proud to be vegan. Real Food Daily, Native Foods, Veggie Grill and more. 95. When someone says I helped them go vegan. 96. Frozen Banana Blender Ice Cream. And ice cream smoothie bowls. 98. Meeting or chatting with my heroes. 99. Animal organizations that rescue animals or fight for their rights. 100. Being a blogger and sharing with my readers. Writing. Knowing I can always jump into my imagination and put something creative down on paper.